Israeli soldiers conducted, on Tuesday at dawn, massive invasions and violent searches of homes in different parts of the occupied West Bank, including occupied East Jerusalem, and abducted twenty-four Palestinians, including a woman, former political prisoners in addition to a father and his four sons. Dozens of soldiers invaded the Suwwana neighborhood, next to the Walls of the Old City of occupied East Jerusalem, searched and ransacked homes and abducted seven Palestinians, in addition to one who was abducted in Bab Hatta neighborhood, next to Al-Aqsa Mosque. The abducted Palestinians have been identified as Fadi al-Kilani, Mahmoud Msha’sha’, Mohammad Abu Lafi, As’ad al-Ashhab, Ahmad al-Ashhab, Majdi Abu Ghazala and Kamal al-Imam, in addition to Ahmad al-Julani, who was abducted from his home in Bab Hatta neighborhood. In the Hebron governorate, in the southern part of the West Bank, the soldiers also stormed and ransacked homes and abducted Jawad Issa al-Hroub, 37, from Deir Samet town, while resident Mojahed al-Hoor was abducted from his home in Surif town, north of Hebron. In Hebron city, the soldiers abducted a father, identified as Khairi Abu Hadeed, along with his sons Fahed, Mohammad, Amir and Nimir. The soldiers also invaded Beit Ummar town, north of Hebron, and abducted Ahmad Hussein Sabarna, 21, after searching and ransacking his home, in addition to the home of Ahmad Hammad Abu Mariya. Furthermore, the army invaded Sammoa’, Surif and Tarqoumia town, in the Hebron governorate, and installed many roadblocks before stopping and searching dozens of cars, and interrogated many Palestinians while inspecting their ID cards. 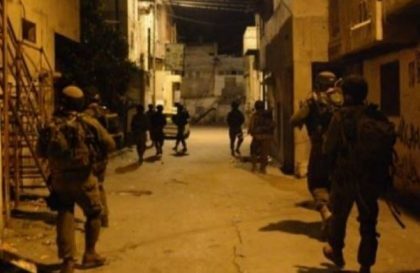 In Nablus, in the northern part of the West Bank, the soldiers invaded homes in Salem town, and abducted Waheed Ghassan Jabara, 22. The soldiers also detained a woman, identified as Rima Mansour, 30, after invading her home in Kufur Qalil village, and released her several hours later at the Huwwara military roadblock, south of Nablus. In Tulkarem, also in the northern part of the West Bank, the soldiers invaded Tulkarem city and Tulkarem refugee camp, violently searched homes and abducted five Palestinians, including two former political prisoners. The Tulkarem office of the Palestinian Prisoners’ Society (PPS) said the soldiers abducted two former political prisoners, identified as Adha Azem and Ahmad Abu Ni’ma, 32, in addition to Wahbi Jarmi, 25, and Wa’ad Ghassan Salem, 24, from Tulkarem refugee camp, and Yahya Jamal Swai, 21, from Tulkarem city. In Tubas governorate, in the northeastern part of the West Bank, the soldiers invaded the al-Far’a refugee camp, south of Tubas city, shot and injured two young Palestinian men with live fire, and abducted two others, identified as Qoteiba Abu al-Hasan, 17, and Mohammad Shaweesh, 19, after breaking into their homes, in addition to searching many homes in the refugee camp, causing excessive damage.